Knots and tangles in your dog's fur are not fun and can be difficult to comb out without causing your dog distress. But fear not. 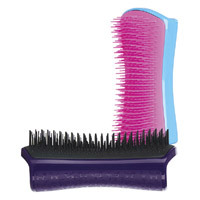 Introducing the Pet Teezer Detangling Brush. Brought to you by the world famous hairbrush brand Tangle Teezer, Pet Teezer addresses dog grooming needs in a gentle and efficient way. The Pet Teezer Detangling Dog Grooming Brush easily deals with tangles and matts in your dog's coat quickly and gently without pulling or tugging. Simply brush gently at the knots until they begin to tease apart. Then give your dog a pleasurable brush all over in the direction of their coat to finish the grooming to make them feel happy and relaxed. The patented two tier teeth design means that the clever bristles work together not only to detangle and remove matts but also to release dirt from your dog's coat whilst smoothing and protecting against matting. Light and hollow with palm-friendly ergonomic design, it is comfortable to hold and reduces wrist strain. Easy and quick to clean. Simply lift the hair from the brush teeth and rinse with warm water. Allow to dry naturally with teeth facing up. This brush can be used on both wet and dry coats. It also makes a great general dog grooming brush. Is this brush suitable for my dog? Pet Teezer make two dog brushes - this detangling brush and also a deshedding brush. 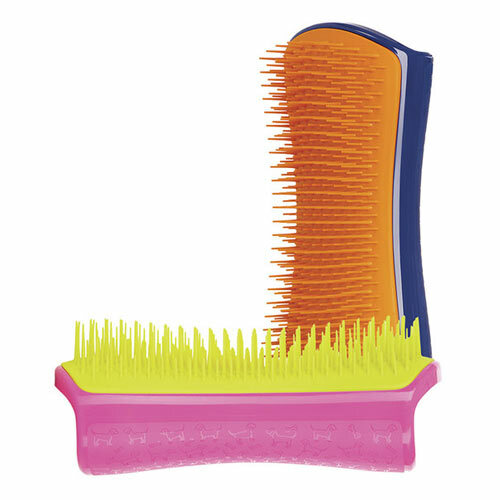 If your dog has fine hair which knots and matts easily, this Pet Teezer Detangling brush is best. It has slightly softer teeth which are designed to gently tease knots and tangles apart. If your dog sheds hair around the home and on your clothes, the Pet Teezer Deshedding brush would benefit your pet. They have slightly stiffer teeth to get confidently down to the undercoat.